The Twins' front office faces an exceedingly difficult task this offseason as they try to pick up the pieces from a disastrous 99-loss season and put the franchise back on the path to contention. How much money will they have to work with? Who's available on the free agent market at areas of need? Which players might be available in trade? How will arbitration shake out? How much might it cost to bring back internal free agents like Michael Cuddyer, Jason Kubel and Joe Nathan? We answer all these questions, and more, in the latest edition of the TwinsCentric Offseason GM Handbook, a comprehensive e-book guide to the Hot Stove League geared specifically toward Twins fans. We provide all the information you need to step into the general manager's shoes and craft your own offseason blueprint within a realistic budget. 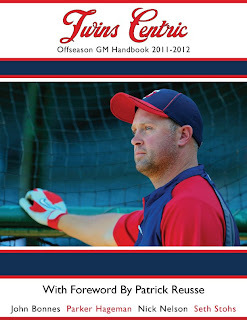 how do we access Twins GM guide if we pre-purchased it in October? Last year's was excellent and I'm excited to read this years edition. You should received a download link via email when the Handbook officially released. If not, shoot us an email at twinscentric@gmail.com and we'll make sure you get your copy. All rights reserved by TwinsCentric. Simple theme. Powered by Blogger.